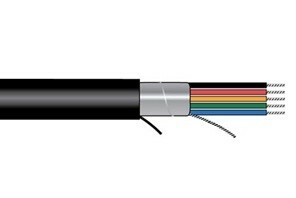 Xtra-Guard® 4 cable has a temperature range from -50ºC to +125ºC. The high performance TPE insulation and jacket offers three times the low-temperature flexibility of ordinary PVC. Provides moderate resistance to oils, solvents, chemicals and fuels. Features outstanding ultraviolet light stability in all jacket colors. UL Rated TC 600 V and PLTC 300 V for cable tray applications (except 24 AWG). Pennsylvania Bureau Deep Mining Safety approved for mine-wide monitoring systems. Provides exceptional protection against EMI interference when Supra-Shield is specified. Tinned Copper Conductors. TPE Insulation. TPE Jacket. (Blk Std, 9 colors avail. ).